Notionery: system that helps you do "routine" things like remembering, learning and expressing yourself, about your known things (subjects, themes, domains, people, whatever you have idea/notion of). not a framework or platform in pure software meaning... more of a philosophy. It's same as in software-making - it's the people that are the trouble (and the fun). Hypothese1. The effort required for capturing notions with the aim to store, translate and (re)use them, is too much work, too cumbersome and without sufficient sizeable and/or sufficiently clear benefits. well, that is a Fact. Lets live with it. ... i've tried to summarize my digging around personalization, semantic "web" 3.0, linked data, faceted search and what not. it's all theoreticaly sound, except that noone bothers to put people in the equation. the problem with all of it is very earthy: all things match some language (classification is a primitive language), and language is, what? fictional thing. All the approaches are still simply statistical thus mathematical thus virtual - anything can be 5 and 5 can be anything. Sooner ot later it becomes Calling names, of sorts, esp. with simplistic languages. The context is the person (and hir state of mind + time-relation, now- then- future), and that context is lost after first typed word, and isn't gained back on 10th, and probably even on 100th or 1000th. That's why suddenly everyone are interested in all sort of "unconscious" automatic gatherable contexts, like geography, backlinks, open applications, tweets etc. Which doesnt really solve the problem, only narrows and moves it elsewhere. hence, the easily found solution is go other way around - can't understand what people want (?#@), so let them have what is understood ($$$). After all it's yet another kind of virtual "crowd brain", so who cares - if one doesnot think, s/he would be much better this way, living the safe life of something else (e.g. idol). Those who think, would still have to dig for their own life - but it never has been any different. ... i keep adding stuff to the page... and in a way a feel more and more into.. deep hole?. somewhat hopeless. esp. the more i see people involvement as huge factor, and i start seeing why everyone so far is staying away from all this. it's much easier to analyze million words that are there and "correlate" and call that mess "THE crowd wisdom" than to make someone write 10 coherrent words of HIS own, and worse, put HIS system behind it. machines do what u tell them, people dont. the several times i presented+explained the idea, i felt the sheer resistance of the common-rails thinking, at different stage/level for different people, but always some. There's sooo much of the "culture" that has trained us to take for granted and not to think about things (=beliefs) that others have come to believe (without thinking for themselves). have you noticed that most things around are biased or based on "There must be only one" Single Order of Everything... so i got questions like "all science (IT) so far is trying to unify the world, and you're trying to break it apart?" real communication: communication is translation, not "just synchronising"
the coordinates of the "space" of notioners are only who-when (brain/time) - all else is a perception (items). And, internaly, time is not the external common mathematical time, but the personal one. Although in order to be able to communicate, it is converted/translated to and from common one. e.g. "when i got married" depending on aspect may translate to a date, year, or season, or age.. btw, this lines up with Hofstede's cultural dimensions and my idea of person-geografical "years" - someone being born out of time and out of space..
DBIN.org - Semantic Web Communities2006 - seems a newsgroup-like p2p exchange of semantical annotations, demo, java, rough. 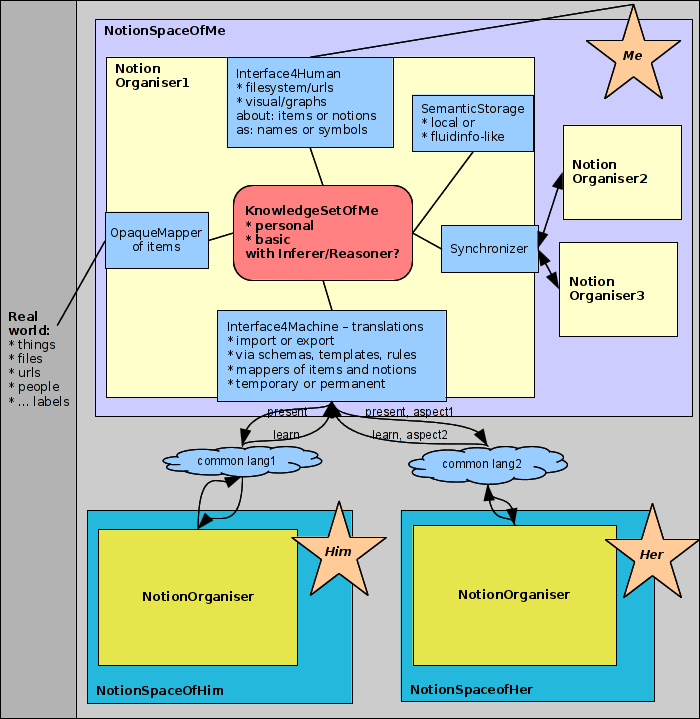 SWAP CWM pychinko reasoner - ~2002, semantic inference engines, n3 language, parser/compilers, and all that jazz - abandoned? ?